Quick and tricky or quiet and easy; canoe, kayak, raft or tube; the floating experience in Northwest New Jersey comes in many flavors. On one extreme, quiet paddling can be found on the Delaware, the D&R Canal, Raritan South Branch, Millstone, Walkill and the Passaic rivers. 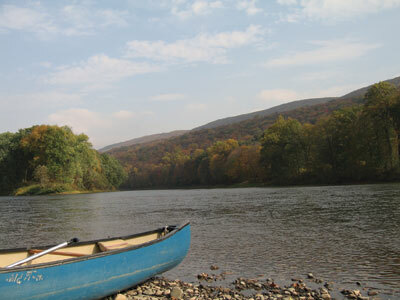 More excitement can be found in the spring, and after rainy spells, on the Paulinskill, Pequest, upper South Branch, and selected portions of the Delaware. For folks interested in something in between, there are the North Branch (Raritan), Musconetcong and Lamington rivers. But, with or without the added excitement of whitewater, each river offers its own special brand of melodrama. Many paddlers will prefer the wide-open space of a lake or reservoir, where it’s easy to get back to where you started. There is park access at Spruce Run, Round Valley, Merrill Creek, Swartswood Lake and Lake Hopatcong. Smaller water bodies, like White Lake near Blairstown or Crater Lake above Millbrook, are equally inviting. For wildlife watchers any choice will be exciting. Escorts of wood ducks, great blue herons, kingfishers and common mergansers show up often on many of the Skyland’s rivers. Owls being mobbed by crows, bluejays and their unlikely confederates, the chickadees and nuthatches, are often seen along the South Branch, Passaic, and Millstone rivers. And the Delaware River islands–Tocks, Poxono, Depew, Sambo–follow along a gentle, easy ride spiced with beaver, bear, wild turkey, egrets, heron, and eagles. For historians and railroad fans, there is a rich history of mills, canals, and relics of the golden age of railroads. Passing under or traveling along the routes of the Lackawanna's Phoebe Snow or the Lehigh's Black Diamond offers a perspective not generally seen by land-based observers. Phillipsburg, Changewater, Neshanic Station, High Bridge and Hainesburg are among the many towns and villages that offer interesting skeletons of the heyday of steam. Rivers and rail-beds parallel and criss-cross each other throughout the region, and artifacts can be seen everywhere by those with an eagle eye, an inquiring mind, and a canoe or kayak. It is always best to paddle with others. A good way to start is with a canoe club or your county park system. They will usually help you obtain the necessary equipment and provide helpful hints on what to bring. They also will generally provide a car shuttle, as it is not very appealing for most people to paddle upstream. Spring and winter paddling can be dangerous for the inexperienced and unprepared, so it is best to tag along with more experienced paddlers, especially at that time of year and if the water is unusually high. 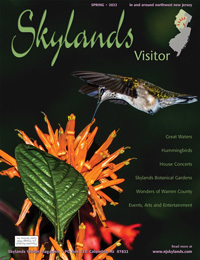 Because water is usually low in the summer, liveries are not too abundant along Skylands rivers other than the Delaware. Some outfitters will rent canoes to "carry”, along with the necessary roof-top carriers. Those that do not provide that service can sometimes be convinced with a big enough deposit. On the Delaware, liveries run by seasoned professionals along both the New Jersey and Pennsylvania banks can assure you of a safe trip with consistently up-dated equipment, the convenience of shuttles from end to end, and words of advice that will make your trip the best it can be. Favorite canoeing stretches for year-round placid paddling are the Delaware above Lambertville (with the exception of Foul Rift, just below Belvidere), the D&R Canal and the South Branch (below Clinton). Ordinarily, these will have sufficient water all year but, during dry spells, it is sometimes necessary, on the South Branch, to go down below Neshanic Station to minimize the out-of-canoe experience. The best Skylands white-water paddling is generally in early spring on the Paulinskill or Pequest or on the South Branch at the Lockwood Gorge (above High Bridge). Conditions will depend on water level and, while Class III and even IV rapids can be found on occasion, these rivers can usually be relied on to offer, at minimum, a few interesting stretches of Class II+ water. The Delaware too will offer some Class II water at Foul Rift (below Belvidere) and at the wing-dam (just below Lambertville). But once again, the degree of difficulty (or danger) will depend on water levels and temperatures. A typical day trip ranges from 6-12 miles and sometimes as much as 15 miles for more hearty souls. Bring a camp stove or bag lunch, and the outing becomes a picnic too. Afterward, a well engineered stop at a local restaurant or pub can offer opportunities to share the day's events and cement relationships. Cruising the rivers, lakes and ponds of the Skylands has a way of erasing the more hectic aspects of life and, for people of all ages, a day in a canoe or kayak with good friends is hard to beat. Knowing the rivers- their beauty, history, and hazards- can provide you and your family with many days of enjoyment this summer. If possible, plan your trip for a weekday, and you’ll feel like your have the water all to yourself. Class I: Moving water with a few riffles and small waves. Few or no obstructions. Class II: Easy rapids with waves up to 3 feet and wide, clear channels that are obvious without scouting. Some maneuvering is required. Class III: Rapids with high, irregular waves often capable of swamping an open canoe. Narrow passages that often require complex maneuvering. Class IV-VI: Generally not done in open canoes.